Like any dying organism, the Nazi regime lashed out against its enemies during late 1944 and early 1945. The most famous of these actions, the so-called “Battle of the Bulge,” is the focus of our America Triumphant game. Less well known but equally critical in destroying Germany’s military potential was the offensive in Alsace, Operation North Wind, which opened a few weeks later. 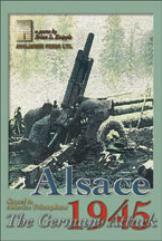 Alsace 1945 covers the American offensives of November and December 1944 and the desperate German counterattack in January. The game system, used previously in America Triumphant, covers these three battles in scenarios requiring only a few hours to play. A fourth covers a hypothetical German attack launched in conjunction with the Ardennes (“Battle of the Bulge”) offensive to the north and capable of being played alone or with America Triumphant. • Drive to the Westwall. The American November offensive ground to a halt with few gains for the losses suffered. After reorganizing, the Americans resumed their drive toward the Westwall on the 5th of December. German forces had been stretched thin as the High Command ordered mobile formations transferred out of the area to prepare for the upcoming offensive in the Ardennes. Those remaining had been bled white by the American attacks. With the new 12th Armored Division on loan to Patton’s Third Army, where it replaced the worn out 4th Armored Division, the two American corps attacked north in the morning hours. • Operation NORDWIND. The Ardennes offensive stretched the American Seventh Army’s front as units spread out to hold territory previously held by units of the Third Army sent north to attack the southern flank of the German penetration of the Allied lines. With the German advance stalled, Hitler looked for an opportunity to strike a blow against the Allies and came up with the Alsace region of France where the Germans believed the Americans were especially weak.